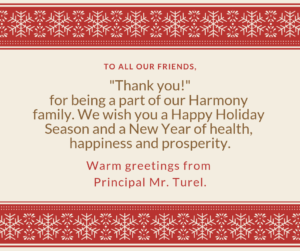 https://harmonypublicschools.network/hsaelpaso-new/wp-content/uploads/sites/121/2017/10/HSA-El-Paso-white-letters-300px.png 0 0 tkilic https://harmonypublicschools.network/hsaelpaso-new/wp-content/uploads/sites/121/2017/10/HSA-El-Paso-white-letters-300px.png tkilic2018-12-20 14:43:462018-12-20 14:44:02Happy Holidays and New Year! 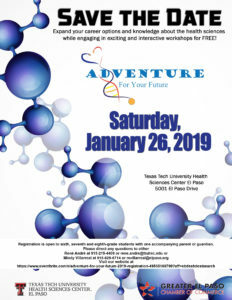 Expand your career knowledge about the health sciences while engaging in exciting and interactive workshops for FREE! Registration now open for 6th, 7th and 8th-grade students and a parent. EVENT WILL COMMENCE IN AN OUTDOOR TENT, THEREFORE DRESS ACCORDINGLY. You are cordially invited to our STEM / CTE Advisory Meeting that will be on next week Wednesday, December 12, from 5:30 pm to 6:30 pm. Even though with a great STEM program in place, we believe that there is always room to improve. We would appreciate if you could stop by and share your thoughts and expertise regarding STEM education. 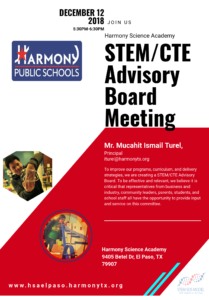 Please let us know if you plan to attend this meeting by sending an email to Mr. Mucahit Ismail Turel, iturel@harmonytx.org by the end of this week.